Look out – the We First paperback is here! I arrived home last night to find a box of the We First paperback’s on my doorstep courtesy of my publisher, Palgrave Macmillan. You never really feel like these things are real until you actually see them for yourself and it’s always a thrill to finally hold it in your hands. 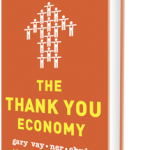 I share this to let you know that the book would be of great value to you in terms of building you business, brand and a better world, and it’s now available in paperback here.